Last January, I walked onto Rue de Douai in the Pigalle neighborhood of Paris, the quarter of the city specializing in musical instruments. After passing what seemed like endless shop windows of guitars, one shop stood out as markedly different. The window of Cham music displayed rows full of finely crafted ouds, their broad wooden bodies varnished and gleaming. Inside I found the owner, Khaled Bako, originally from Aleppo, Syria, but a long-time resident of Paris, whose shop has been exporting Middle Eastern ouds to Europe for the last two decades. He spoke to me about how the war in Syria has devastated the state of Syrian oud production. I had first heard about the disappearance of certain Syrian ouds in a music shop in downtown Jerusalem the month before, where the owners told me that the Syrian instrument maker, Ibrahim Sukar, had disappeared in the early days of the war. Despite the contentious border between Syria and Israel, Jewish musicians with origins from the Middle East and North Africa still prized Syrian ouds in the playing of their traditional music. 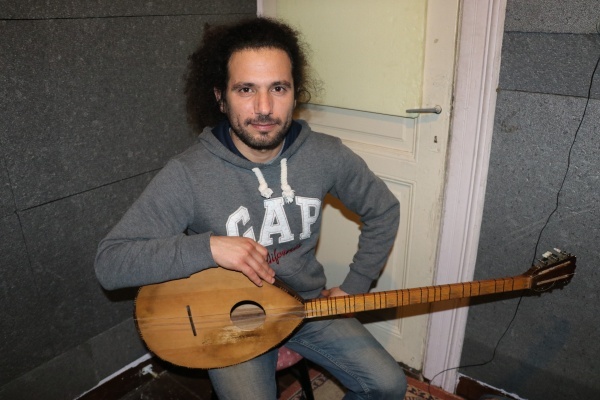 A month later in Paris, the Syrian oud player Mohanad alJaramani, originally from the largely Druze city of Sweida in the south of Syria but now living in exile, also mentioned Sukar, saying that he had so loved his family’s kanun made by Sukar that he and his brother, also a musician, had asked his seventy-year old mother to bring it with her when she visited France from Syria. 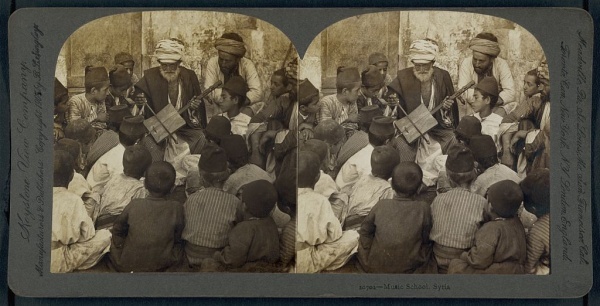 Later in Istanbul, Sukar’s name came up again: Hozan Peyal, a Kurdish buzuq player from al-Hasakeh, had fled to Turkey only to discover that the buzuq prized in Kurdish traditional music was not available in Istanbul. He managed to acquire a buzuq crafted by Ibrahim Sukar that had been sent across the border from Aleppo. He was so worried about the disappearance of buzuq production that he was hoping to learn how to make them himself. I was surprised by how much a single instrument maker had impacted so many instruments and musical communities in such different places. Now, no one knew where Sukar was: everyone was asking. In fact, I was not in Cham Music in Paris for more than twenty minutes before two French customers entered, asking Bako if he had any Sukar ouds. The story of how Bako came to sell Syrian ouds in Paris in the first place is as Aleppian as any story I can think of. Bako grew up in Aleppo, a city that, due to its location on historic trading routes, is as westward looking as it is firmly planted in the Middle East. As a boy he was given a toy guitar. He soon fell in love with the sound of the guitar when he listened to a cassette of music by Enrico Macias, a Jewish Algerian who had immigrated to France, and whose musical cassettes of Arab-Andalucian tunes had made their way into the diverse, cosmopolitan world of Aleppo’s music shops. Though guitar was unusual in Aleppo at the time, Bako was intent on playing it, and so he found a teacher in Vatche Yeramian, a well-known musician in the city’s large Armenian community who was playing western instruments such as the tenor saxophone as well as guitar. The tutelage paid off, and Bako eventually became an accomplished guitarist, moving to Damascus and– after doing his military service as part of a musical ensemble– performing with famous musicians such as George Wassouf. So it was that a guitar player from Aleppo, Syria only learned to play the oud when he moved to Paris, France. He sold one oud, then two, then three. It soon became apparent that there was an unexpected demand for the Arabic instrument in France. On a trip back home to Aleppo, Bako met Ibrahim Sukar, a mechanical engineer who had become known in Syria for his instruments. They were inexpensive, extremely well- constructed, and created a depth of sound uncommon in such inexpensive ouds. Bako began importing one hundred ouds a year from Aleppo to Europe, learning from Sukar how to varnish and repair them, and slowly learning to play the oud along the way. At first, Middle Eastern musicians in Europe purchased ouds from him, calling from as far away as Germany. In time, French musicians, who recognized in the instrument the origins of their own lute, began seeking it out as well. Then, in 2011, the war in Syria started. As I’ve been thinking about disappearing cultural heritage in Syria, my mind keeps returning to the question of the country’s music. Aleppo alone contained an astonishing wealth of musical traditions, from the dhikrs of the Sufi Muslim communities to the chants of the Armenian communities, and the chorals in Syriac– an endangered dialect of Aramaic– in the Syriac Christian communities. Before they left, the city’s Jewish population was known for baqashot, a special tradition of singing prayers on the Sabbath that was unique to the city. The city is also famous for muwashashah, an ancient form of sung poetry that tradition says originated in Andalusia, but which has been preserved in Aleppo for centuries. Today, the city’s most famous musician is Sabah Fakhri, a vocalist known as the master of tarab. Though difficult to define, tarab describes a process in which something magical happens between an audience and a performer, allowing the audience to achieve what might be described as a kind of ecstasy. The process by which tarab happens is complex: it requires skilled musicians, a highly trained vocalist who sings a song differently every time he engages with it, beautiful lyrics, and an audience with enough experience in music to recognize and respond to the chemistry being created by the musicians. Fakhri is famous for interacting with his audiences, for example. Aleppo itself is referred to as the “mother of tarab,” both for the quality of its musicians but also for the level of its audiences. Yet these communities have scattered–both the musicians and their audiences. Much of the Armenian community of Aleppo is now in Armenia, though they are also in Lebanon, Europe and Canada. Sufi musicians are in the south of Turkey as well as Europe. In addition to the normal perils, many secular musicians found themselves in an impossible situation during the war. Some of them joined artists who were part of the early demonstrations against the Syrian government, and in the ensuing crackdowns they fled. Then, as Islamist groups later joined the opposition, those who remained found themselves targeted by extremist groups who disapproved of secular music. The result is that Syrian music is now in exile all over the world. Syrian musicians are performing in Paris, Holland, Germany, and Istanbul. Syrian music schools are operating in Lebanon and in refugee camps in Greece. One positive side effect is that the world is being exposed to Syrian music in a new way. Bako mentions that the presence of Syrian musicians in Paris means there are now more music concerts of Arabic music. 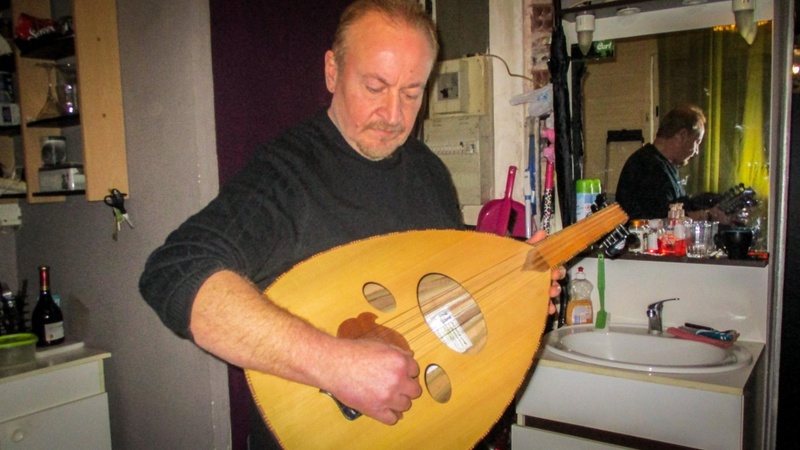 Each time there’s a concert, the next day French people show up in his shop, wanting to buy the oud. The Syrian Expat Orchestra in Germany, founded by Raed Jazbeh, a musician from Aleppo, now performs all over Europe, often to sold-out crowds. Kinan Azmeh, the clarinet player from Damascus, has been bringing his music to the United States. Sufi musicians from Aleppo have been recording their music in the south of Turkey, just as the Wajd ensemble is keeping Syrian Sufi music alive in Europe. Dima Orsho, the soprano, has performed in America and Europe, and the kanun player Maya Youssef is becoming well known in the United Kingdom. Twenty-one year old Rami Basisah, who became famous for smuggling his violin with him in cling film as he fled Homs and took a rubber dinghy to Europe, recently played at the Royal Albert Hall in London. Ibrahim Keivo, an Armenian musician from the al-Hasakah region and currently living in Germany, has been educating audiences on the music of Armenians, Assyrians, Kurds and Yezidis in northeastern Syria. And on and on. It is becoming increasingly apparent that Syrian music is currently making a mark on the world music scene. Yet music is an art passed on through transmission, and it remains to be seen what will happen to the rich Syrian traditions in cities like Aleppo, now that so many of its master musicians are gone.